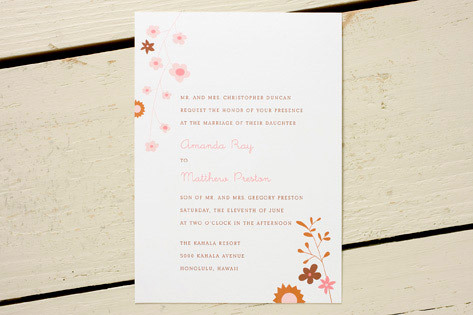 These whimsical wedding invitations signal that spring is here! Sweet, stylized flowers create the perfect frame for the invitation information, while the soft, subdued colors add a warm, exciting touch. Available in chocolate brown/medium (shown), chocolate brown/poppy orange, and chocolate brown/sage green.